Celebrating a quarter of a century in the industry, JJ Valaya put out a diverse collection of occasion-wear and couture inspired by his classical muses. With Gulistan, he paid a gentle homage to nature’s ever-growing beauty of florals and colours in forms of signature prints and antique embroidery in sinuous silhouettes. Jamavar presented the glorious magic of Indian paisleys and intricate motifs with modernity. Punjab was a humble tribute to the royal court dressing of the Maharajas of Kapurthala. For a collection of such varied elements, their co-existence was a welcomed union. Inspired by the serene and natural beauty of the Sundarbans, Anupama Dayal evoked ‘Jalpari’, the mermaid of its waters with her collection of resort wear. Popping sunset hues such as sorbets, lilacs, lavenders and melons brought prints of flora and fauna to life on fabrics of light gossamer, chiffons, silks and Chanderis. 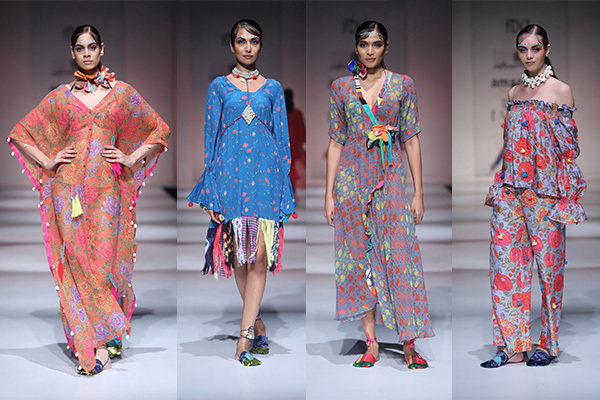 The silhouettes were breezy, consisting of kaftans and beach-wear with the ease of being mixed and matched. Titled ‘Indigofera’, this collection by Schulen Fernandes was inspired by the fabled indigo plant and dye in modern interpretations. The highlight was complemented by other offsetting colours such as ivory, arctic blue, leaf green, orchid pink, marmalade orange, coral red, egg yolk yellow and rose quartz in colour blocked patterns. Denim, cotton and linen were transformed into pleated collars, cutaway blousons, wrap belt ties and leaf-shaped pattern pieces to accentuate a minimalist line that’s perfect for summer. Samant Chauhan stuck to his signature ivory and red combination as he presented his collection, inspired by the philosophy of the Renaissance and Art Nouveau. In luscious fabrics of organzas and cotton silks, the collection was dominated by exaggerated silhouettes of frills, peplum jackets, bustles and trains, all etched and embroidered with delicate florals. Created in collaboration with Milind Soman, this collection consisted of four distinct lines, each related to different parts of India, in terms of culture, colour and textiles. While Ikat represented the East, Indigo represented the West, Banarasi brocades represented the North and Uppada and Narayanpet saris represented the South; all infused with the trends of colour-blocking and stripes. 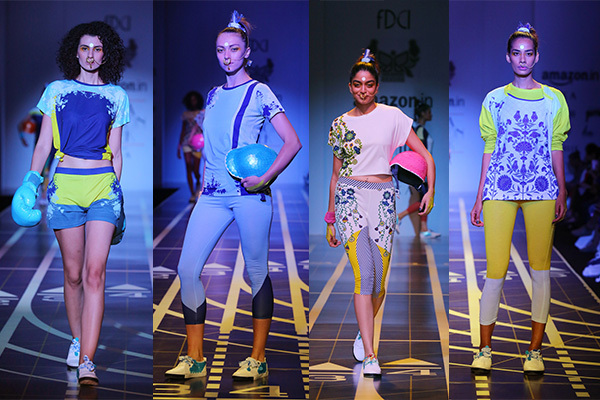 The silhouettes were kept comfortable and all-inclusive with athleisure patterns. The highlight of the collection was that it was completely crafted out of 100% recycled plastic bottles and also featured the first ever running sari, keeping with Soman’s life story. 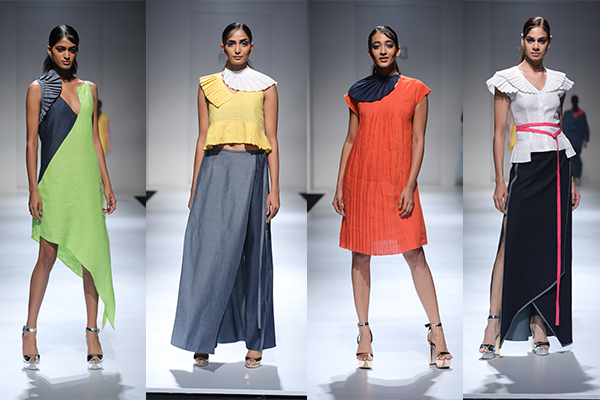 Rimzim Dadu celebrated a decade in the industry by continuing her fascination with surface textures. While yarns and cords dominated the collection, this collection also manipulated traditional zari, metallic yarns, resham and silk thread by way of deconstruction and reconstruction, giving it a more fluid feel. Saris, sculpted statement tops, mini shifts, jackets and skater dresses carried their structural silhouettes in these innovative and evolving signature themes.